In Task 1 of the IELTS Writing modules, you may be asked to interpret and describe data presented in graph form. There are three basic types of graph: pie charts, bar charts and line graphs. Bar charts are useful for comparing the quantities of different categories. Bar charts are constructed such that the lengths of the different bars are proportional to the size of the category they represent. Bar charts usually show the numbers or percentages on the y-axis and the different categories that are being measured along the x-axis. Both axes are labeled to show what they refer to. Sometimes each category along the x-axis can be divided into two further sub-groups, e.g. 1997/2004, so that these sub-groups can be compared. 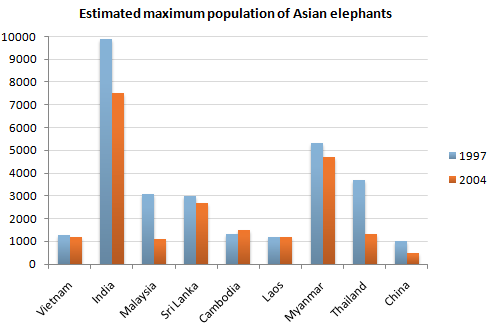 The graph shows the estimated maximum population of elephants in a range of Asian countries in both 1997 and 2004. In most of the countries included in the graph, the population fell. This was most noticeable in Malaysia and Thailand, where the number of elephants was thought to be less than half the figure in 1997. In the former, the number of elephants dropped as low as 1000. India remained the country with by far the largest elephant population, but experienced a dramatic fall in numbers so that in 2004 there may have been as few as 7500. Despite its size, China had a very small population of at most 500 elephants by 2004. Although the trend was downwards overall, elephant populations were thought to have remained stable in Laos and Vietnam at approximately 1200. The only country where elephants showed signs of recovering was Cambodia, where numbers may have risen by up to 200.